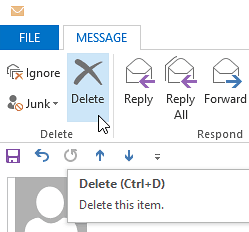 Outlook returns to the folder of a message after deleting it. Here’s how to navigate through you inbox more quickly by opening the next message instead. 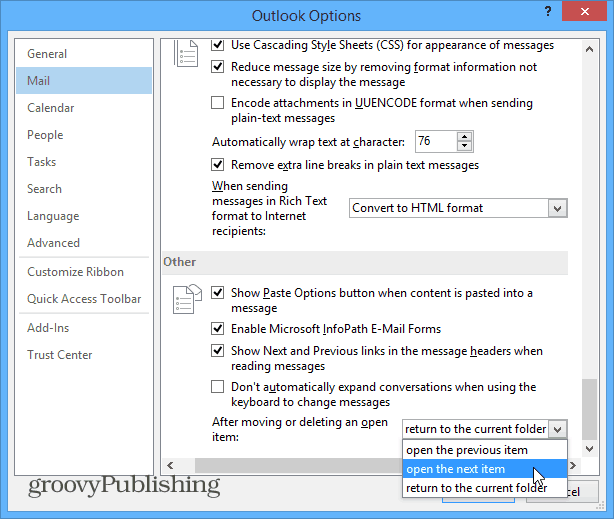 Outlook, by default, will return to the folder of a message after you delete it. If you get hundreds of email every day, it’s always good to find an advantage to get through them faster. To make things go more quickly, you might want to go directly to the next message. 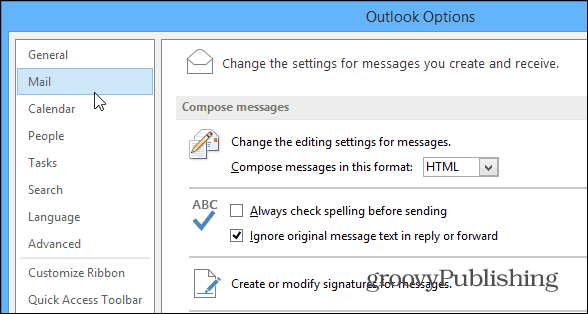 Here’s how to set that up in Outlook 2010 and the new 2013. Go to File > Options and select Mail in the left pane. Then in the right side scroll all the way down to the Other section. You’ll see “After moving or deleting an open item” from the dropdown menu, select Open the next item and click OK to save the changes. That’s all there is to it! Now when you delete an open message, it will open the next message right away versus going back to the current folder you’re in. This tip will allow you to manage your email in a more rapid fashion. After I open my outlook 2013 emails I do not like how they display. I need to have a better system to view all open emails as the list takes forever to go through. Here the same issue with outlook 2016 for mac, anybody knows some resolution? I have done what you suggest a hundred times, close the computer etc but it still puts a line through the message instead of deleting it and then I have to arrow down to the next message and so on and so on, when I close Outlook it then gets rid of the ones that have been crossed out. I really dont know how this change happened as it has always worked well and overnight it all changed. I have the same issue with outlook 2016 for mac, anybody knows some resolution? I have done this 2 times with my Office Pro 2010 and it doesn’t open the next message. Reverts back to the reading pane. Help? This solution only works for emails being opened in a separate window. I do 90% of my e-mail reading in split preview, and this does not solve the issue in that use case. In split preview, Outlook always moves to the next message down the view – I keep newest e-mails at top of view and thus want Outlook to move to the ‘previous’ message in the view, which typically is the next unread e-mail (or chronologically newer e-mail). Actually, it gets a little more complicated than that. The setting seems to also impact the preview mode, but there is no way to configure it separately. In my workflow I do not want any new message opened when I delete a message being viewed in a separate window, but do want the preview to progress to chronologically newer message. The only workaround is to reverse sort order in the message list – an unfortunate compromise.